MEMBERS ONLY SAVINGS! Looking to buy or sell a home? As a West Metro Chamber member, you are eligible for a member discount on your next real estate transaction. Let's save you some money and start Living Large with Livingston! Medically Devoloped Supervised Weight Loss Program Effective, Predictable & Safe. Shed 2-3 lbs per week. Burn Fat & Maintain Muscle. We will help you take it off & keep it off! 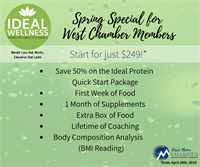 Complementary Room Rentals for all Chamber Members! We offer a wide variety of room spaces for groups anywhere from 5 to 240. All room rentals include staff, tables, chairs, linens, dining ware,silverware & glassware. All catering is done in house from our scratch kitchen, where we can customize and modify all dishes to be as unique as your event and guests. Our catering and event staff will assist you throughout the planning process to alleviate any needs or concerns, ensuring that your event is ran seamlessly. Call and book your next event at MVCC today!